A painting workshop that gets rave reviews in Naples and Vero Beach will debut in the Indianapolis market in June. As a culmination of Zionsville's Annual Garden Classics event, the class will cover the basic principles of oil painting with regard to painting florals, and still life- fruits and vegetables. Includes interesting and memorable discussions on composition, massing, building form, light and shadow: and depending on your own style, knowing when a work is finished (learning how to not overwork your painting). Douglas really delivers sound principles of painting that are an incredible foundation for your painting, whether a beginner or seasoned professional. After the brief morning intro, a schoolroom type lecture covering principles that will be reviewed and referenced throughout the workshop, followed by a very hands-on approach to the class, gets students mixing colors and preparing to paint. Students will work in their own style/technique so that the finished work is their own. Douglas will overview his palette and concepts that his work entails. Students will mix paints and learn to mix basic strings of color to help comprehend how this preparation makes the painting process a little simpler and gets a working understanding of the value/strings of color. This is an important part of Douglas' workshop as he always paints from this palette. 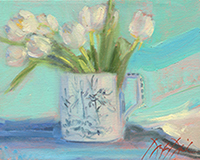 Students will paint primarily from Indiana Peonies and maybe some Tulips or Lilacs if they are still in bloom. Also a few fruit and vegetable still life's including Watermelon, Bananas and maybe something like a fresh Grapefruit-with arrangements of bowls and china plates and bold graphic table coverings, with strong side lighting make for a wonderful alternative subject to the florals.The thought Douglas puts into these classic arrangements and timeless subjects is as important as the painting itself. He will show you how he does it and why he makes the choices he does. A discussion on the pitchers, vases and vessels he chooses along with the cloth and fabric samples he uses will be included. An incredible 3 day, hands-on painting experience will yield a good number of paintings and a logical thought process in a fun yet focused atmosphere to help you guide your future study. Your paintings can be as complicated or as simple as needed. Demos and individual discussions/instruction will help each student to start to begin to reach the preliminary goals they are striving to meet. Plan to produce several studies and at least one or two larger, more finished paintings, depending on skill level. Plan to bring notebook/sketchbook and enjoy some demos along with some great stories to help you remember the principles that are the foundation of Douglas' teaching. A small informal group show among ourselves on easels in our classroom will end the class on a high note as we share our accomplishments in this condensed time of study. Douglas David has painted his way across the country, capturing the beauty and spirit of the things he loves- tranquil country landscapes, sunrises and sunsets on his favorite beaches, a simple pitcher of spring lilacs or peonies, a lemon, lime or a slice of watermelon on a checked tablecloth. Paintings that reflect comfort, warmth meaning and simplicity: similar to everything important to him- his close knit family, life-long friendships, creatively fulfilling work and giving his best. A recipient of numerous regional and national awards and honors, Douglas' teaching is a way of giving back and sharing some of his journey with those who choose to study with him. For more detailed information, visit www.douglasdavid.com. Floral/Still Life OPTIONAL oils - Greenish Umber Mixture, Sap Green, Burnt Sienna, Jaune Brilliant No 1,2,3 and or 4.